Looking for your Local Real Estate Expert? Are you interested in buying or selling in Darien CT, Rowayton CT or Naples FL? Elaine Falkenberg’s intimate knowledge of the Darien & Rowayton markets provides her with an edge in the buying and selling of luxury Connecticut Homes. With over 15 years of real estate experience, Elaine is able to work closely with her clients and provide specialized guidance on market trends. 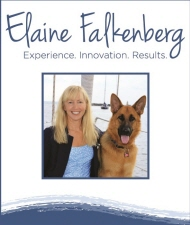 Elaine is a marketing maven and provides new and innovative ideas to help sell her listings. Elaine has expanded to Naples Florida and now has a team in the Connecticut and in Florida. Spectacular Video of 35 Rowayton Ave!